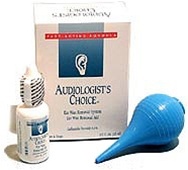 This over the counter product gently softens and loosens ear wax with the power of peroxide. It includes a soft rubber bulb syringe which is used to gently flush the wax from the ear. AARP members now have access to one of the most comprehensive programs in hearing health available today. Take back your hearing health and your life with exclusive savings for AARP members from HearUSA. Take a closer look at the many benefits of the AARP Hearing Care Program provided by Hear USA.